Happy New Year! 2014 was a fantastic year filled with lots of great moments and memories, but I look forward to 2015 with hope and excitement. There will be new goals, accomplishments, and even more memories made. I can’t wait to see what this new year brings! 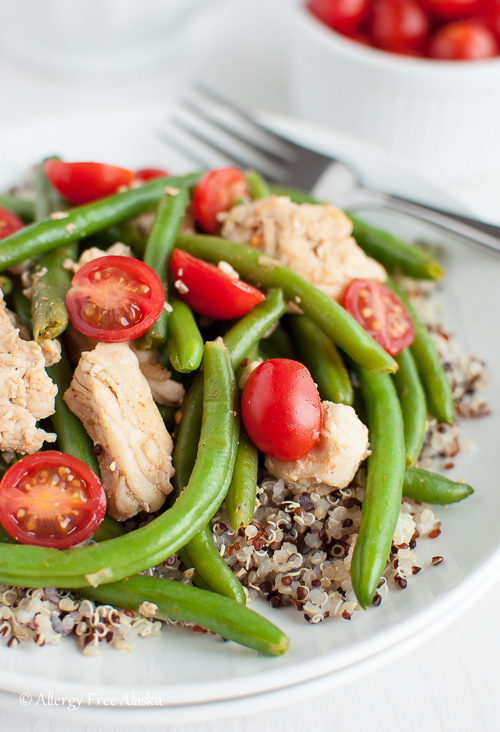 When I set out to make this Smokey Chicken and Green Beans Over Quinoa dish, I actually didn’t think I would post the recipe on the website. Our family had a busy day, I was pressed for time, and hadn’t planned anything in advance for dinner. I defrosted some chicken breasts I had in the freezer and quickly threw dinner together with ingredients I had on hand. AJ and the girls ended up loving it, and they all agreed I needed to post the recipe for you. Gotta love it when recipes on the fly turn out to be a family favorite! 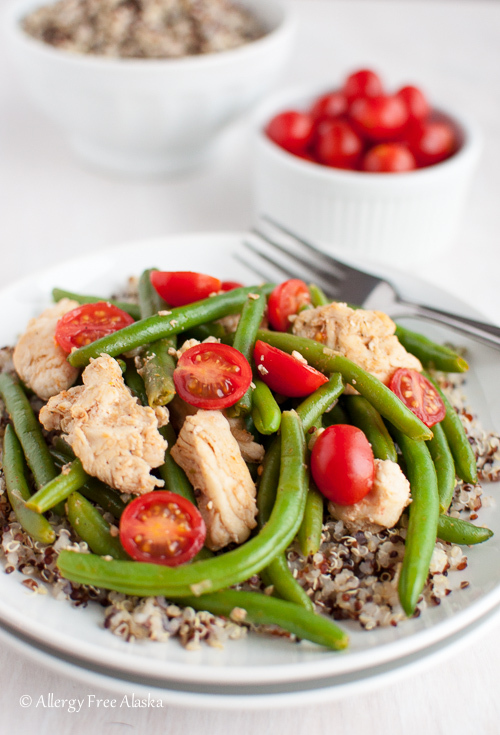 At first glance, this Smokey Chicken and Green Beans Over Quinoa might not appear full of flavor, but I can assure you it most definitely is. 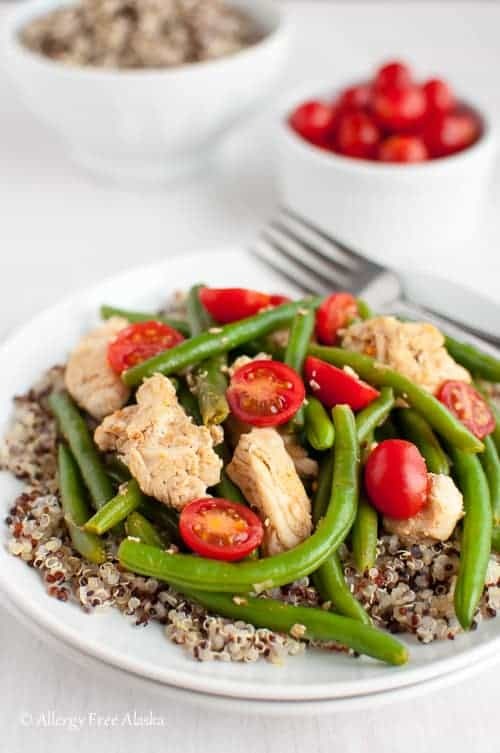 Chicken pieces are cooked in ghee, shallots, fresh garlic, and smoked paprika, then tossed with green beans, more smoked paprika, and fresh grape tomatoes. The end result is moist, tender, slightly smokey and rich chicken pieces with scrumptious green beans, and tangy, sweet tomatoes that burst in your mouth as you chew. 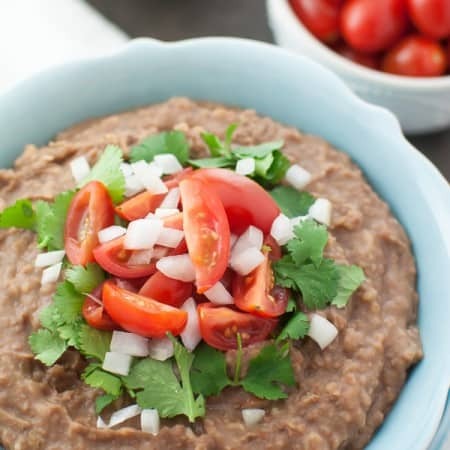 This is an easy and healthy meal your whole family will enjoy! 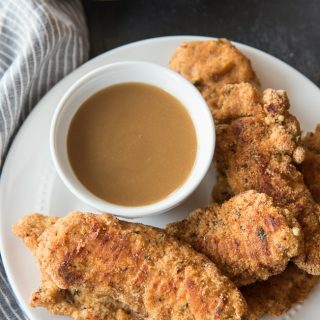 Cook the quinoa and tenderize/cut up the chicken breasts a day in advance; when you’re pressed for time this dish will come together even more quickly with that prep work already done. Use paper towels to blot any excess moisture from the chicken breasts, and then place them in a gallon sized sealable bag. Put the bag on top of a large cutting board, and use the smooth side of a meat tenderizer/mallet to pound the chicken until it is about 1/2-inch thick (if you don’t have a meat tenderizer/mallet, you can also use a heavy rolling pin to beat the chicken). Remove the chicken breasts from the bag and cut into 1-inch pieces. Discard the bag. 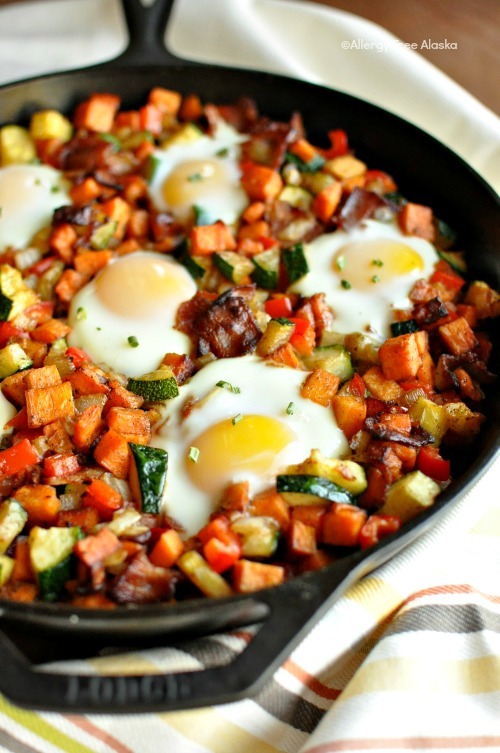 In a 12-inch skillet (I recommend this pan), warm the ghee over medium heat. Add the shallots and garlic and cook for 1-2 minutes. Turn the heat to high and carefully place the chicken in the pan. Season with 1/2 teaspoon of smoked paprika, sea salt and ground black pepper. Stir occasionally and cook for 10 minutes. Add the frozen green beans to the skillet and season with the remaining 1/2 teaspoon of smoked paprika. 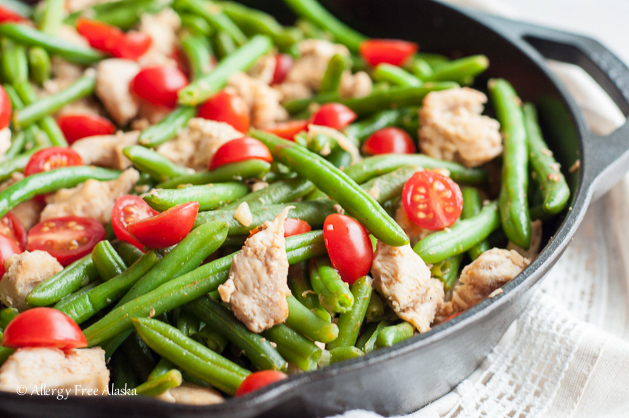 The skillet will be full, so very carefully use a pair of tongs to toss the green beans with the chicken. Toss occasionally, and continue to cook for about 7 minutes, or until the green beans are hot. Remove from heat and toss in the grape tomatoes. Season with more sea salt if desired. Serve hot over quinoa. Cook according to package directions, or use The Better Way to Cook Quinoa method: Place the uncooked quinoa in a saucepan with 6 cups of water. Bring to a boil and simmer for 12-15 minutes, or until done. Strain through a fine mesh sieve and transfer the quinoa to a medium sized bowl. Let rest for 5 minutes, and then gently fluff with a fork. Tri-color quinoa is a blend of black, red, and yellow quinoa. Feel free to use any color of quinoa you prefer. 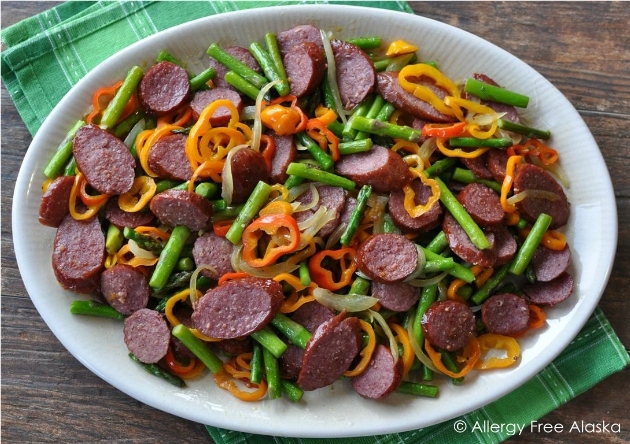 If you have fresh green beans on hand, I'm sure they will probably work fine in this recipe. You just might need to cook them a little longer than what the recipe calls for. This post is linked to Savoring Saturdays, Saturday Night Fever, Tasty Tuesday, Talented Tuesday, You’re Gonna Love It Tuesday, Handmade Tuesdays, Fat Tuesday, Two Cup Tuesday, Gluten Free Wednesday, Homestead Blog Hop, Create It Thursday, Gluten Free Friday and Foodie Friday. This is so appealing looking! I could envision us eating this and not having to coax the two boys to eat it and fits Mark’s diet perfectly. It is all foods they enjoy. Chicken is their favorite! It is brilliant in it’s simplicity, and so quick. 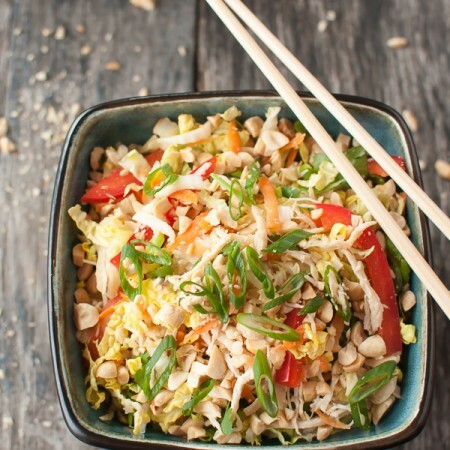 I’ll have to make this since it sounds and looks so tempting, is practical on our busy days, and I also have these ingredients on hand almost of the time.